Next up we'll be sinking into the Throne of the Tides Cataclysm instance, deep below Vashj'ir to find out how much gold you can make in this instance when soloing on Heroic mode. The instance offers teleports, so it's much faster to move around the place. However, there is less trash here than in the previous instance, Blackrock Caverns. Does that mean you'll be getting less wow gold here? Let's find out! Throne of Tides is one of the fastest heroics, and the loot is not half-bad! Getting to this instance is more simple than one would think. Sure, it's deep below the ocean in the middle of nowhere where you cannot fly without getting almost killed by fatigue. So how the hell does one get there fast? If you have done a little bit of questing in Vashj'ir at some point, you can use the portal to Vashj'ir in your capital city to gain fast access to it. If not, you'll have to fly there. It's little bit west from Dun Morogh or Stormwind Harbor. Once there, you can use the Abyssal Seahorse mount to travel to the instance itself. If you don't have an underwater mount, then it's best to use your flying mount and fly above the sea until you are directly above the instance. swim to the massive maelstrom. It's a very deep descent, so you might run out of breath though. It's very much recommended that you do at least a few quests in Vashj'ir before attempting the dive to gain permanent water breathing while in Vashj'ir. The instance is located in the Abyssal Reach in Abyssal Depths. 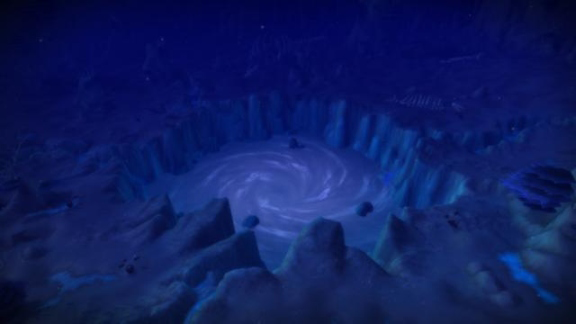 To get to the portal, you need to dive into the massive underwater maelstrom. Just like the previous instance, this too can be done both in Normal and Heroic mode. This instance along with Blackrock Caverns is more profitable to farm in normal mode though, but only if level 77 Cata greens sell fast and for 70+ gold each on your realm. On heroic mode the lowest greenies will be level 82, which are worthless unless disenchanted. Most Cataclysm dungeons drop a decent amount of BOE blues. The lower level ones have nice stats for their level, but there's usually a lot of other sellers, making the prices just silly. In most cases it's better to vendor/disenchant them. As for the difficulty of this instance, it's one of the easiest. No class will have trouble soloing this instance at level 90. Only encounter where you may take damage is the first boss if you get caught in a waterspout, but they are easy to avoid. There's 2 achievements to get here. Soloing them is very easy. Old Faithful: Pretty self explanatory. DPS preferably one of the big adds to near death and wait for a geyser to form below your feet. Move away from it but only slightly, so that the big add is close to it. Prince of Tides: Don't kill one of the Behemoths until you have the massive dps buff called Tidal Surge that you get when the 3 casters die during last phase. This instance is very fast to clear. Only the last boss takes a while because it's so heavily scripted. There's many trash mobs here, almost as much as in Blackrock Caverns. Like always, I pull all trash that I can find, and in this case, also the optional boss. I do not use Potions of Treasure Finding to eliminate a big part of RNG, but you should to get even more loot. Tiny Treasure Chests that you will see dropping will be a big part of your gold income. If you have the Golden Fleece, it's a good idea to equip it for this dungeon, as the mobs are high enough level to give experience. One missing trinket does not affect your farming performance, and you will be getting more gold in exchange. It's a drop from a rare mob in Dread Wastes. Visit the link to see where you can get it. If Embersilk Cloth is valuable on your realm, you may want to do the farming with a Tailor. Northern Cloth Scavenging lets you loot a lot more cloth even in Cataclysm and MOP instances. "Not as much trash as in BRC, but a run is much smoother!"